Background: The goal of hemovigilance is to increase the safety and quality of blood transfusion. Identification of the adverse reactions will help in taking appropriate steps to reduce their incidence and make blood transfusion process as safe as possible. Aims : To determine the frequency and type of transfusion reactions (TRs) occurring in patients, reported to the blood bank at our institute. Materials and Methods : A retrospective review of all TRs reported to the blood bank at the All India Institute of Medical Sciences, between December 2007 and April 2012 was done. All the TRs were evaluated in the blood bank and classified using standard definitions. Results: During the study period a total of 380,658 bloods and blood components were issued by our blood bank. Out of the total 196 adverse reactions reported under the hemovigilance system, the most common type of reaction observed was allergic 55.1% (n = 108), followed by febrile non-hemolytic transfusion reaction (FNHTR) 35.7% (n = 70). Other less frequently observed reactions were Anaphylactoid reactions 5.1% (n = 10), Acute non-immune HTRs 2.6% (n = 5), Circulatory overload 0.5% (n = 1), Transfusion related acute lung injury 0.5% (n = 1), Delayed HTRs 0.5% (n = 1). Not a single case of bacterial contamination was observed. Conclusion: The frequency of TRs in our patients was found to be 0.05% (196 out of 380,658). This can be an underestimation of the true incidence because of under reporting. It should be the responsibility of the blood transfusion consultant to create awareness amongst their clinical counterpart about safe transfusion practices so that proper hemovigilance system can be achieved to provide better patient care. Context: Transfusion transmittable infections (TTI) continue to be a major threat to safe transfusion practices. Blood is one of the major sources of transmission of infectious diseases viz. human immunodeficiency virus (HIV), hepatitis B virus (HBV), hepatitis C virus (HCV), syphilis, malaria, and many other infections in India. Screening assays for the infectious diseases with excellent sensitivity and specificity helps to enhance the safety of the blood transfusions reducing the diagnostic window period as much as possible. 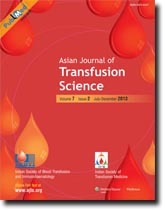 Aims: The present study was designed to determine the seroprevalence of TTIs viz., HIV, HCV, and HBV, among the blood donors in Max Super Specialty Hospital, New Delhi, India based on dual testing strategy using high sensitive screening assays such as enhanced chemiluminescence assay and nucleic acid testing (NAT). Materials and Methods: A total of 41207 blood units collected from the donors (both voluntary and replacement donors) were screened for the TTI s, viz., anti HIV 1 and 2 antibody, anti HCV antibody, anti HBcore antibody, and HBsAg by enhanced chemiluminescence assay on VITROS ® ECiQ immunodiagnostics system. NAT was performed using Roche Cobas ® TaqScreen MPX assay, which can detect simultaneously HIV 1 (groups M and O), HIV-2, HCV, and HBV on Roche Cobas ® s201 system. Results: The seroprevalence of HIV, HBsAg, anti HBcore antibody, and HCV based on enhanced chemiluminescence assay was found to be 0.25, 0.2, 7.06, and 0.7%, respectively. 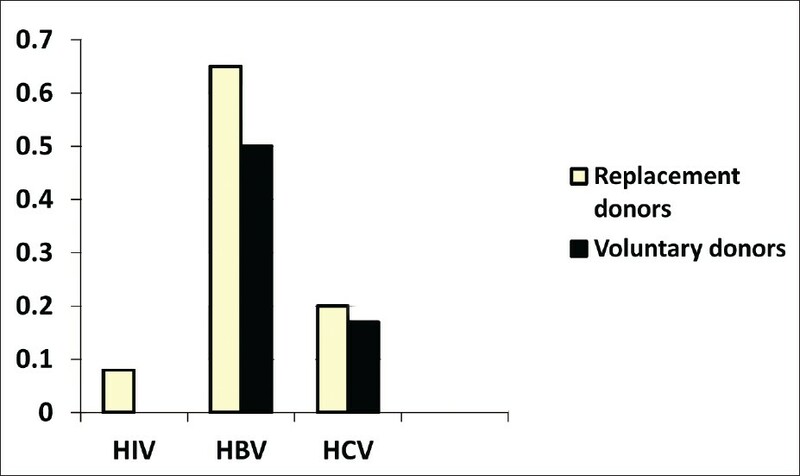 A total number of 6587 samples from July 2010 to December 2010 were tested on NAT, of which 3 samples were reactive for HBV in NAT; this was missed by enhanced chemiluminescence assay. Conclusions: Based on the seroprevalence study of infectious diseases viz., HIV, HBV, and HCV, we conclude that screening of blood and blood components by dual testing strategy using high sensitivity serological assay like enhanced chemiluminescence technology and NAT helps in detecting the potentially infectious blood units in all phases of infection, which aids in enhancing the safety of blood transfusion and reducing the potential risk of post-transfusion infection. Background: A comprehensive survey of RHD alleles in Tunisia population was lacking. The aim of this study was to use a multiplex RHD typing assay for simultaneous detection of partial D especially with RHD/RHCE deoxyribonucleic acid (DNA) sequence exchange mechanism and some weak D alleles. Materials and Methods: Six RHD specific primer sets were designed to amplify RHD exons 3, 4, 5, 6, 7 and 9. DNA from 2000 blood donors (1777 D+ and 223 D-) from several regions was selected for RHD genotyping using a PCR multiplex assay. Further molecular investigations were done to characterize the RHD variants that were identified by the PCR multiplex assay. Results: In the 1777 D+ samples, only 10 individuals showed the absence of amplification of exons 4 and 5 that were subsequently identified by PCR-SSP as weak D type 4 variants. No hybrid allele was detected. In the 223 D-, RHD amplification of some exons was observed only in 5 samples: 4 individuals expressed only RHD exon 9, and one subject lacking exons 4 and 5. These samples were then screened by PCR-SSPs on d(C) ce s and weak D type 4, respectively. Conclusion: The weak D type 4 appears to be the most common D variant allele. We have not found any partial D variant. 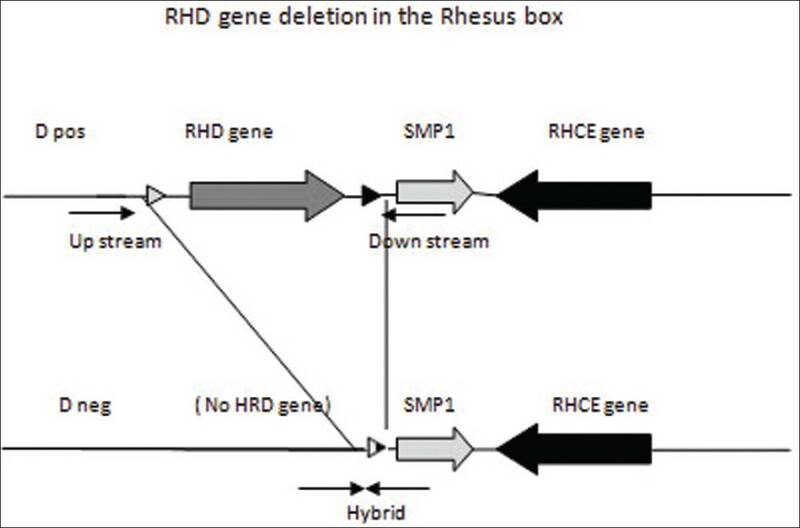 Findings also indicated that RHD gene deletion is the most prevalent cause of the D- phenotype in the Tunisian population. Background : The percentage of HIV cases attributable to blood transfusion has decreased significantly in the last decade. The newer 4 th generation Enzyme linked immunosorbent assay (ELISA) has been shown to have increased sensitivity compared to 3 rd generation ELISA. Objectives : To estimate the seroprevalence of HIV among blood donors using 4 th generation ELISA assay and to compare it with the 3 rd generation ELISA. Materials and Methods : This prospective study involved 10,200 blood donors- 6,800 were voluntary donors (3400-students and 3400-non students) and 3400 were replacement donors. All blood units were tested with 3 rd as well as 4 th generation ELISA. 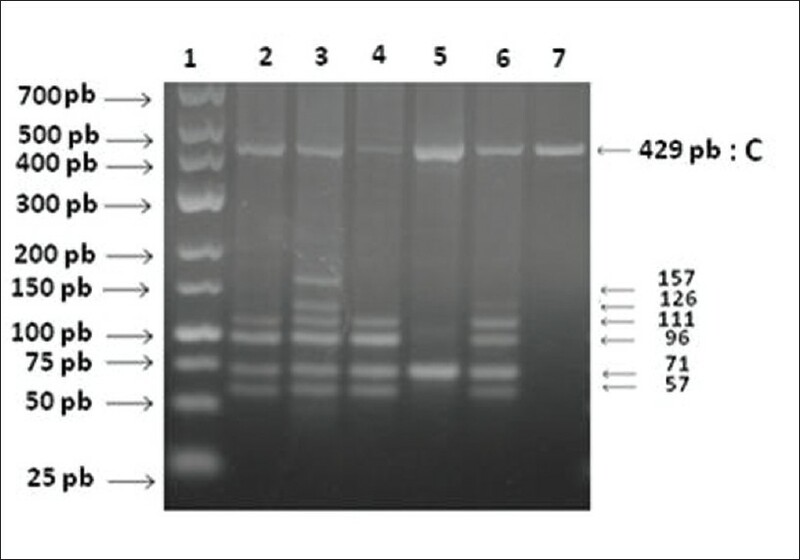 All samples found reactive or in grey zone with either 3 rd or 4 th generation ELISA were retested by Western blot (WB). Results : The seroprevalence of HIV was estimated to be 1.37/1000 donations (0.14%) with 3 rd generation ELISA compared to 3.62/1000 donations (0.36%) with 4 th generation ELISA (p>0.05). The seroprevalence of HIV among voluntary donors was estimated to be 1.32/1000 donations (0.13%) with 3 rd generation ELISA and 3.67/1000 donations (0.36%) with 4 th generation ELISA. The prevalence of HIV among replacement donors was 1.47/1000 donations (0.15%) with 3 rd generation ELISA and 3.52/1000 donations (0.35%) with 4 th generation ELISA. Conclusion : 4 th generation HIV ELISA detects a higher number of seroreactive donors compared to 3 rd generation ELISA. However, larger studies are required with confirmatory tests for both 3 rd and 4 th generation ELISA for making any policy changes. Background: The aim of this work was to investigate adolescents' propensity to donate blood, the incidence in this population of risk behaviors that limit and restrict the potential for blood donation, thus reducing the number of possible subjects suitable for donation, and the link between propensity to donate and healthy lifestyles. Materials and Methods: Adolescents were asked to complete an anonymous self-report questionnaire during class time. The questionnaire included ad hoc items designed to investigate the intention to donate blood and behaviors traditionally considered to put adolescents' health "at risk." Participants were 201 students from northern Italy (range 12-19, M = 17.98, SD = 1.82; 38.9% male, 61.1% female). Results: About half of respondents perceived that they were able to donate blood and could overcome any obstacle that might prevent them from doing so. Some of the examined risk behaviors were widespread in the population under consideration. The linear regressions run show that there is no link between the propensity to give blood and a tendency to engage in healthy lifestyles. Conclusion: The study shows that adolescents demonstrate an interest in blood donation; however, it shows a real lack of "action" to make it happen: there is, indeed, a serious lack of attention to matters related to healthy lifestyles. In fact, adolescents are not aware of how to act to access the world of donation, with the risk that they present themselves at blood donation centers and are then found to be unfit to donate. The research offers many suggestions and implications. Background: Serological safety is an integral part of overall safety for blood banks. Emphasis is on the use of routinue Red Blood Cell (RBC) antibody screen test, at set time intervals, to reduce risks related to alloantibodies. Also emphasis is on importance of issuing antigen negative blood to alloantibody positive patients. Effect of using leucodepleted blood on the rate of alloimmunization is highlighted. The concept of provision of phenotypically matched blood is suggested. 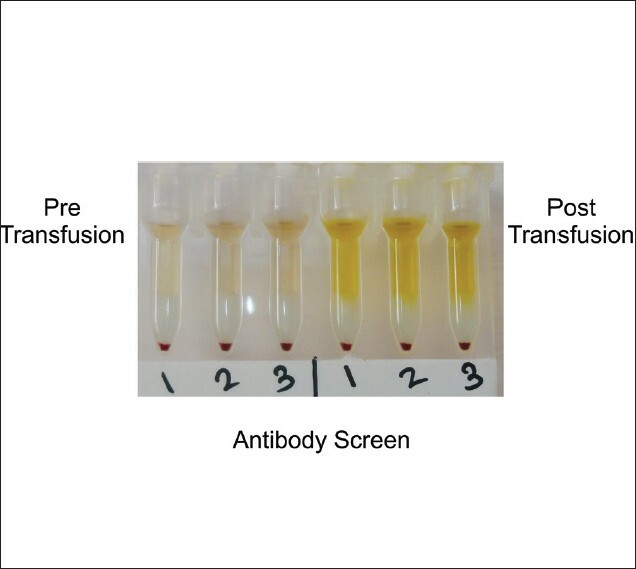 Materials and Methods: Antibody screen test is important to select appropriate blood for transfusion. Repeat antibody screen testing, except if time interval between the earlier and subsequent transfusion was less than 72 hours, followed by antibody identification, if required, was performed in patients being treated with repeat multiple blood transfusions. Between February 2008 and June 2009, repeat samples of 306 multi-transfused patients were analyzed. Search for irregular antibodies and reading of results was conducted using RBC panels (three-cell panel of Column Agglutination Technology (CAT) and two cell panel of the Solid Phase Red Cell Adherence Technology (SPRCAT). 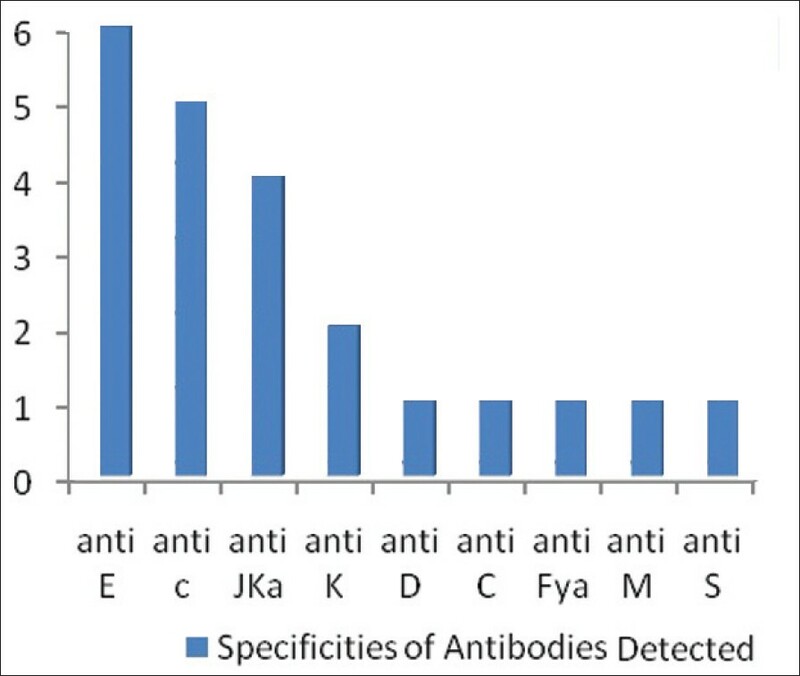 Specificities of antibodies were investigated using appropriate panels, 11 cell panel of CAT and 16 cell panel of SPRCA. These technologies, detecting agglutination in columns and reactions in solid phase, evaluate the attachment of irregular incomplete antibody to antigen in the first phase of immunological reaction more directly and hence improve the reading of agglutination. Three to four log leuco reduced red blood cells were transfused to patients in the study using blood collection bags with integral filters. Results: Alloimmunization rate of 4.24% was detected from 306 multiply transfused patients tested and followed up. The Transfusion therapy may become significantly complicated. Conclusion: Red cell antibody screening and identification and subsequent issue of antigen negative blood have a significant role in improving blood safety. Centers that have incorporated antibody screen test and identification have ensured safe transfusion. Identified patients should be flagged in a database and information shared. Such patients can be given carry-on cards and educated about the names of the identified antibodies. Full red cell phenotyping of individuals, patients and donors, can be feasibility. 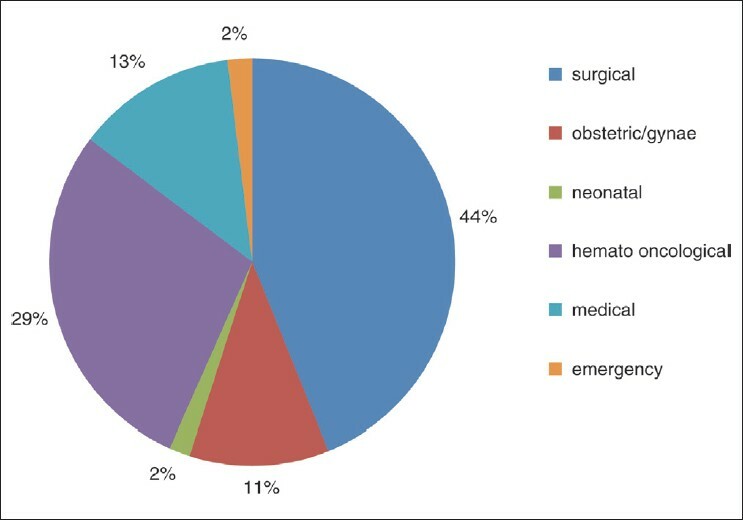 Context: Extensive bleeding associated with liver transplantation is a major challenge faced by transplant surgeons, worldwide. Aims: To evaluate the blood component consumption and determine preoperative factors that predict the same in living donor liver transplantation (LDLT). Settings and Design: This prospective study was performed for a 1 year period, from March 2010 to February 2011. Materials and Methods: Intra- and postoperative utilization of blood components in 152 patients undergoing LDLT was evaluated and preoperative patient parameters like age, gender, height, weight, disease etiology, hemoglobin (Hb), hematocrit (Hct), platelet count (Plt), total leukocyte count (TLC), activated partial thromboplastin time (aPTT), international normalized ratio (INR), serum bilirubin (T. bilirubin), total proteins (T. proteins), albumin to globulin ratio (A/G ratio), serum creatinine (S. creatinine), blood urea (B. urea), and serum electrolytes were assessed to determine their predictive values. Univariate and stepwise discriminant analysis identified those factors, which could predict the consumption of each blood component. Results: The average utilization of packed red cells (PRCs), cryoprecipitates (cryo), apheresis platelets, and fresh frozen plasma was 8.48 units, 2.19 units, 0.93 units, and 2,025 ml, respectively. Disease etiology and blood component consumption were significantly correlated. Separate prediction models which could predict consumption of each blood component in intra and postoperative phase of LDLT were derived from among the preoperative Hb, Hct, model for end-stage liver disease (MELD) score, body surface area (BSA), Plt, T. proteins, S. creatinine, B. urea, INR, and serum sodium and chloride. Conclusions: Preoperative variables can effectively predict the blood component requirements during liver transplantation, thereby allowing blood transfusion services in being better prepared for surgical procedure. Severe hemolysis was observed in a critically ill patient with G6Pd deficiency where the causative trigger could not be identified. We describe one young patient with severe hemolysis treated with two cycles of plasmapheresis which proved to be an effective tool in the treatment. The patient presented with diffuse pain abdomen, vomiting, yellowish discoloration of sclera and skin and acute breathlessness. Hemoglobin 5.4 mg/dl and total (T) serum bilirubin 17.08 mg/dl: Direct (D) 4.10 mg/dl and Indirect (I) 12.98 mg/dl. 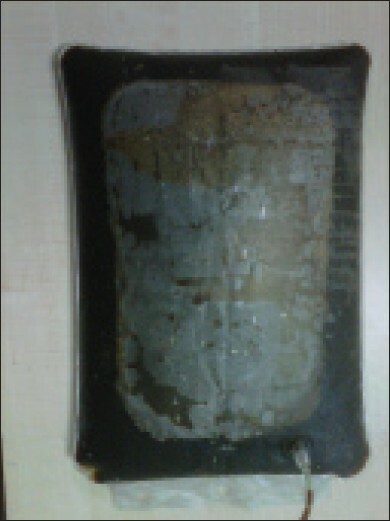 Subsequently patient started passing black color urine. As the patient developed severe hemolysis and the trigger agent of hemolysis was unknown, two cycles of plasmapheresis were performed with the aim to remove unknown causative agent. Consequently no trace of hemolysis was found and patient stabilized. Plasmapheresis can be used to treat G6PD deficient patients with severe hemolysis due to unidentified trigger agent. It appears that delayed hemolytic transfusion reactions may occur several days after the administration of donor red cells is true even though they have been shown to be compatible in cross match tests by the antiglobulin technique. A specific case was observed in our center, which confirms the fact. The patient was a 37-year-old male suffering from intermediate β-thalassemia. He had a history of two previous transfusions, with unknown transfusion reaction. In the last transfusion, laboratory data showed: Hb 7.8 g/dL and Hematocrit (Hct) 24.2%. The patient received two units of cross matched, compatible concentrated red blood cells (RBCs). After eight days a severe reaction was observed with clinical evidence of tachycardia, fatigue, fever, back pain, chest discomfort, jaundice, nausea and anorexia. Accordingly delayed hemolytic transfusion reaction was suspected, and anti-RBC antibodies were tested. Laboratory tests revealed the presence of three alloantibodies: Anti-N, anti-S, anti-K, and a monospecific autoanti-JK b .
Autoimmune Hemolytic Anemia (AIHA), a very infrequent condition which represents a group of disorders in which presence of autoantibodies directed against self-antigens leads to shortened red cell survival. Till date, a very few cases of AIHA in Malaria patients are reported worldwide but still AIHA should be considered a relatively rare cause of anemia in malaria. A 20 year male presented with intermittent fever since seven days and yellowish discoloration of urine and sclera since 5 days. He was transfused three units of blood at a private clinic before one month. On examination, pallor, icterus and spelnomegaly were present. Hemoglobin (Hb) was 3.2 gm% and peripheral smear revealed ring forms of both Plasmodium vivax and Plasmodium falciparum. 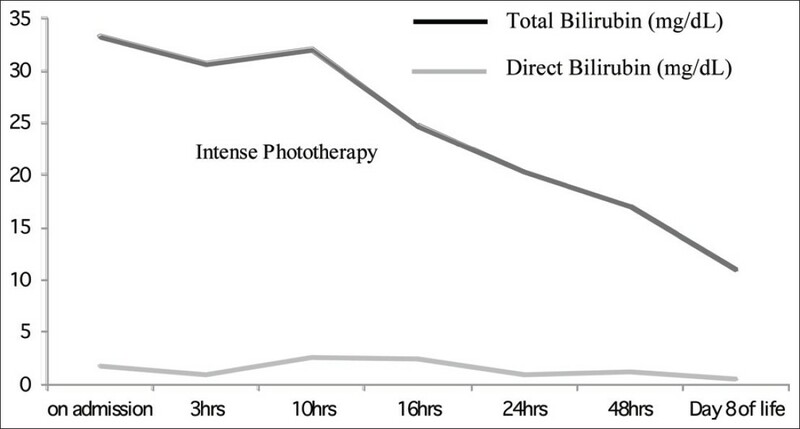 Serum LDH and Serum billirubin (Indirect and Direct) were high. This patient's blood group was B +ve with positive autocontrol. Indirect Antiglobulin Test (IAT), antibody screening and antibody identification were pan-positive with reaction strength of +4 against each cell. Direct Antiglobulin Test was +4 positive anti IgG and negative with anti C3. He was treated with Artesunate and methylprednisone. Least incompatible, saline washed O Neg and B neg red cells were transfused on the 2 nd day of starting treatment. Hb was raised to 6.1 gm% on 4 th day. Patient was discharged on 9th day with Hb 7.0 gm% with oral tapering dose of steroids. In the above case, patient was suffering from high grade malarial parasitemia with co-existing autoimmune RBC destruction by IgG auto-antibodies which led to sudden drop in Hb and rise in serum LDH and indirect billirubin. Least incompatible packed red cells along with antimalarials and steroids led to clinical improvement. So far, one case report each from India, Korea, Canada and Germany and one case series report of three cases from India have been reported. Under-reporting or rarity of this phenomenon may be accountable for this. We are reporting a rare case of severe hemolytic disease of newborn (HDN) with Bombay phenotype mother. A retrospective study of a case with severe haemolytic disease of newborn with Bombay phenotype mother was done. Blood grouping, antibody screening, and lectin study was done on the blood sample of the baby and mother to confirm the diagnosis. Hematological and biochemical parameters were obtained from the hospital laboratory information system for the analysis. Blood group of the baby was A positive, direct antiglobulin test was negative. Blood group of the mother was confirmed to be Bombay phenotype, Hematological parameters showed all the signs of ongoing hemolysis and the bilirubin level was in the zone of exchange transfusion. Due to the unavailability of this rare phenotype blood unit, baby was managed conservatively. Anticipating the fetal anemia and HDN with mothers having Bombay phenotype and prior notification to the transfusion services will be of great help in optimizing the neonatal care and outcome. Alloimmunization against the Rhesus-D (RhD) antigen still remains as a major cause of hemolytic disease of fetus and newborn (HDFN). Determination of paternal RhDzygosity is performed by molecular testing and is valuable for the management of alloimmunized pregnant women. A 30-year-old pregnant woman with AB negative blood group presented with two consecutive abortions and no history of blood transfusion. By application of the antibody screening, identification panel, and selected cells, she was found to be highly alloimmunized. RhDzygosity was performed on her partner and was shown to be homozygous for RhD. The sequence- specific priming-polymerase chain reaction used in this report is essential to establish whether the mother requires an appropriate immunoprophylaxis or the fetus is at risk of HDFN.